When turmoil strikes world monetary and financial markets, leaders invariably call for "a new Bretton Woods" to prevent catastrophic economic disorder and defuse political conflict. The name of the remote New Hampshire town where representatives of 44 nations gathered in July 1944, in the midst of the century's second great war, has become shorthand for enlightened globalization. 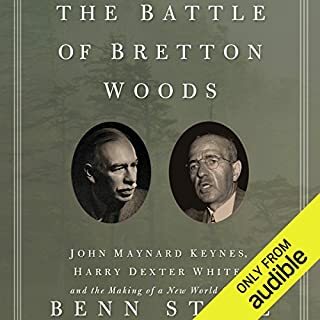 A fitting prequel to his later examination of the Marshall Plan, Benn Steil’s review of the economic and political issues surrounding the Bretton Woods conference combines a tour de horizon of the allies’ policy challenges with compelling biographies of the conference’s two leading characters. John Maynard Keynes is usually the most attention-grabbing character in any story where he played a part, but in this one he is upstaged by the as-yet unresolved questions surrounding the relationship between Harry Dexter White and Soviet intelligence. Even listeners who might ordinarily shy away from the intricacies of international economics will find this tale engaging and enlightening. 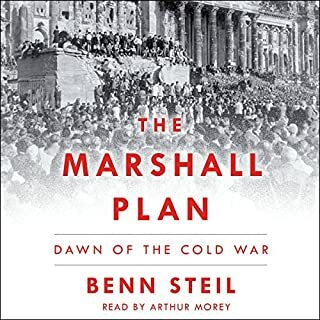 Benn Steil's admirably detailed and textured examination of this critical Cold War initiative not only brings out the challenges faced by Harry Truman, George Marshall, and their subordinates, as well as their allies and adversaries, but clearly connects the choices that they made to today's controversies. Arthur Morey delivers the text with just the right pace and intonation.